Yesterday, I went to see the movies with a couple of friends. My movie buddies. 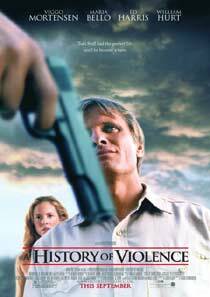 I saw A History of Violence in the Student Theatre with a fellow graduate student from Argentina and from Russia. We were the same group that watched that movie last semester about the Brothers Grimm. The movie was very intense. A couple of gory scenes. And a few mutilated faces here and there. The ending was ambiguous though. It was left to the audience to decide whether the hero is worthy of forgiveness or not. I felt I accomplished a lot today. I was able to conduct experiments to three people. I also started and am near to finishing my Typology homework. I also finished reading the textbook for my Semantics 2 class. I need a haircut. I feel like I want a fresh look. But I can't. And with that, I blame my mother. I am the firstborn, thus, the experimental child. My mother didn't know the proper position in putting a baby to sleep, by that time. So I ended up having a flat head. I wanted so bad to experiment on very ultra short hairstyles (I do want to try shaving my head completely, but it wouldn't work due to the flat back), such as initiation cut, or full skinhead. But unfortunately, my flat back and wide face wouldn't match it. I would look like an egg. The shortest I could get is a spiky buzz cut.